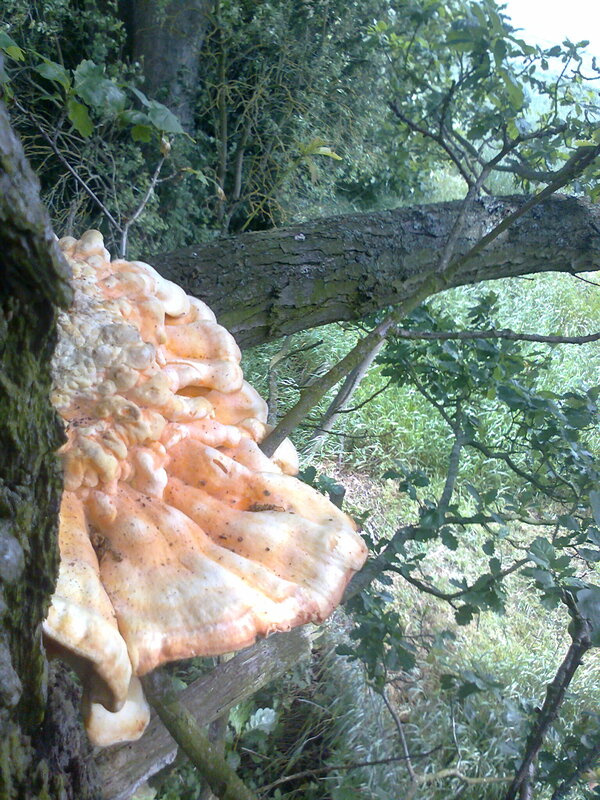 Foraging Friday: Chicken … of the Woods! You might have to climb for these! One of the most exciting things to find and eat at this time of year is Laetiporus sulphureus, commonly and aptly named “Chicken of the Woods”. Appearing from April and sticking around into November, this bracket fungus grows mainly on dead and dying Oaks in the UK. It is nice and easy to recognise but may be inaccessibly high for foragers without crampons. Look for the distinctive clusters of overlapping fans that are bright yellow, turning more orangey as the specimen matures. It takes a good while to establish itself before the fruit actually appears, but once you have located one of these, you will generally be able to revisit it for several years. This is a great eater and it really does behave and taste a little like chicken when you cook it. 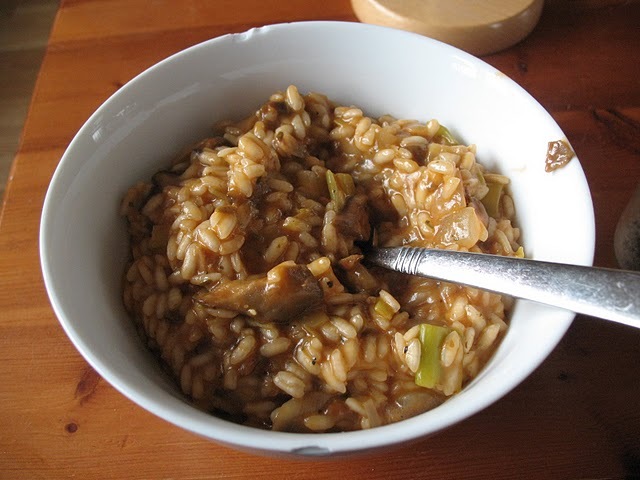 It is important, though, if it is your first time, to try a small quantity as it has been known to cause stomach upsets in some people – and it must ALWAYS be cooked. 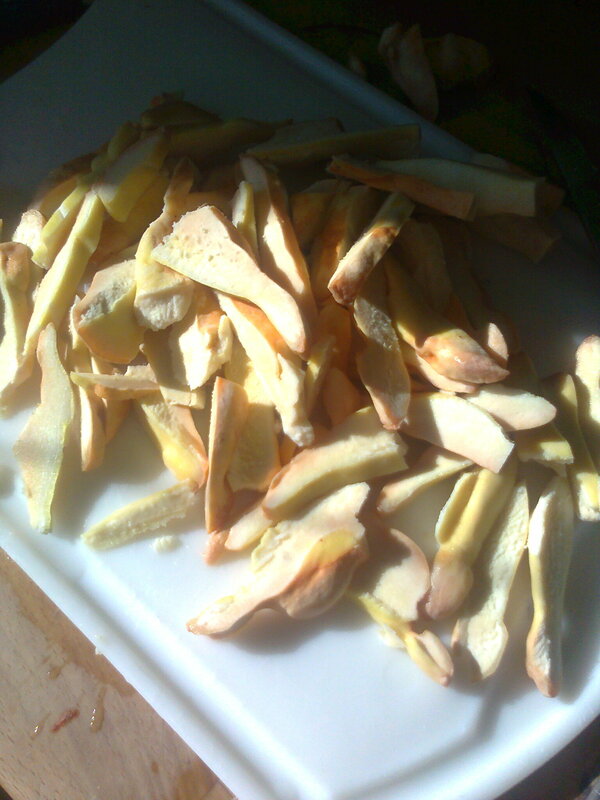 When gathering it, make sure you pick the younger yellow fans as older parts of the fruit are more bitter and tough. When you get them home, clean them up and chop into slices. The mushroom will keep well in the freezer for later use. I generally blanch them before cooking them, to be sure that they are well cooked and to take any bitterness off. My favourite way to eat these is to make up a fairly heavy batter to dip them in and then fry up some “chicken nuggets” using oil that has been sitting for a week or so with some lemon rind in it to give it a citrussy edge. 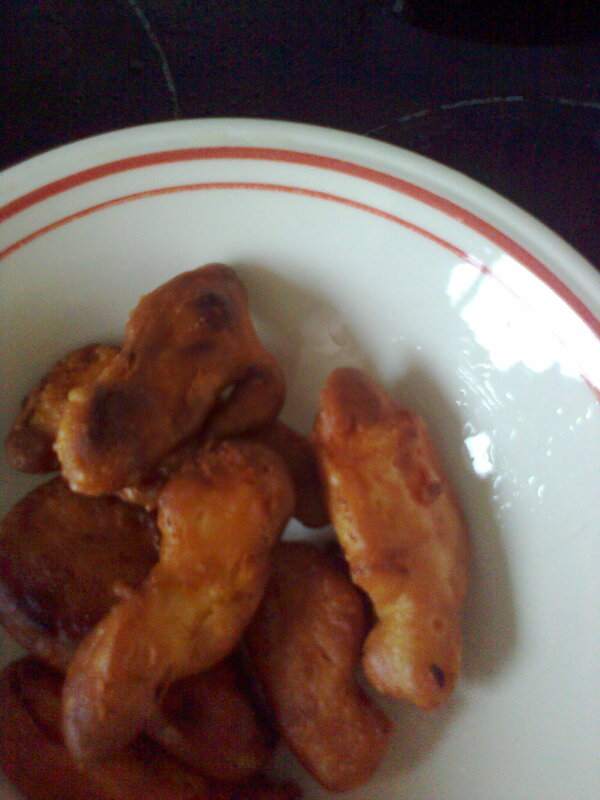 You can use it as you would use chicken in any recipe but make sure that it is always well cooked. Please don’t use my Foraging Friday posts for identification purposes, get a couple of decent books to double check your identification. You are responsible for what you eat. 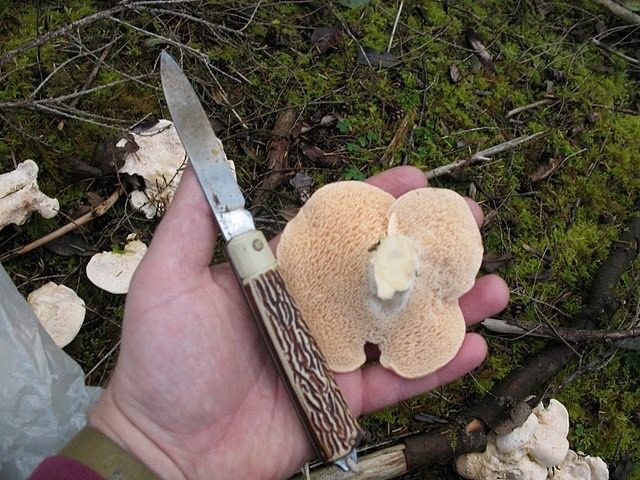 Follow the guidance in my article on “Picking and Identifying Edible Mushrooms“. I won’t be held responsible for people falling out of trees, either (ahem). "Chicken (of the woods) Nuggets"
While most of the UK is under several inches of snow, there’s not much opportunity for foraging but people might be thinking of their Christmas wish lists so here’s a quick guide to the books on my foraging shelf. Probably the most essential and popular book on wild food in the UK. Originally published in 1972, it has certainly stood the test of time. I have a very early hardback edition, from 1973 with a few colour plates and comprehensive line drawings. The more recently available editions of this classic are illustrated with full colour pictures that are more than adequate for identifying foods, although I would still recommend supplementary books if edible fungi is what you are after. Mabey covers absolutely everything that you might want to forage, cut, dig, wade or climb for, including: shellfish, nuts, fungi, roots, herbs and vegetables, seaweed, spices, flowers and fruits. There’s a handy appendix on poisonous plants, too. He includes insightful comments on the history of the wild foods he describes and their uses as well as plenty of anecdotal material that will enrich any foraging expedition. All the usual suspects are there, from Samphire to Ceps, but this is a great book for the more adventurous who might like to try for Monk’s Rhubarb or White Mustard. The book is a handy rucksack pocket size. The only things missing from this are more details on cooking and preparing and maybe some photographic plates – but you can’t have everything. This is a treasure and bang up to date, published in 2007, and packed with full colour photographs that show the foods in their typical settings. A double page layout is given to each food and the sections are helpfully divided by typical location, i.e. Woodland Plants, Riverside Plants, Garden Visitors and so on. The 250 pages cover plants primarily, although there is a well illustrated Woodland Fungi section. The layout is very easy on the eye and each entry covers what, where and when to look for the foods as well as comments on taste and use and any cautions to be taken. A handy little blue box for each entry contains a “foragers checklist” of the most essential features to look for. The prize, though, is a recipes section to get the mouth watering with visions of “Watercress Soup” and “Parasol Platters”. Peter Jordan is the foremost mushroom guru of the British Isles and I would consider any one of his excellent guides (there are several) to be absolutley essential. This volume got me started in mushroom foraging. It contains over 300 colour photographs to aid identification and the book is divided into edibles and poisonous sections, with a thorough introduction to fungi foraging, picking, storing and equipment in general. About 35 edible species are covered, with at least two pages for each entry, that will provide an excellent starting point in the repertoire of a forager. There are a couple of odd items that you are unlikely to find in the UK, like the truffles and matsutake, but this book is not exclusively for the British Isles. It is also too big to lug around in the field, but perfect to keep at home for consultation. This book is full of sound advice that comes from a lifetime of safely foraging for and eating fungi. Peter Jordan’s sound motto was “if in doubt leave it out”. 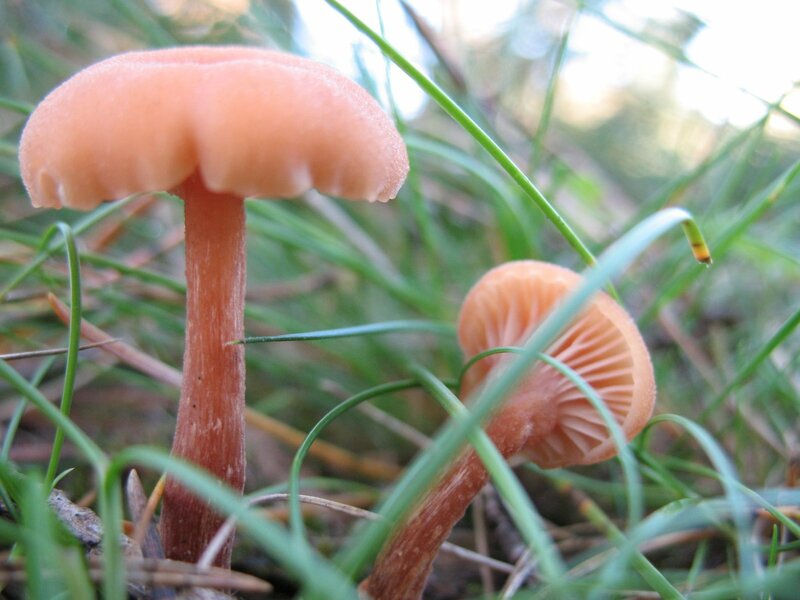 The species covered in The New Guide to Mushrooms are generally among those that would be easiest to identify for a beginner and he always includes some caution about specific poisonous look alikes to avoid. An Illustrated Guide to Mushrooms and Other Fungi of Britain and Northern Europe – Geoffrey Kibby. With a mouthful of a title, this book suggests that it is more of the kind of scholarly guide that I would recommend every forager keeps at home to check identification. It is still not completely exhaustive but this is more of a mycological work. The species are divided by family and genus and details are included in each description such as the microscopic properties of the spores alongside colour illustrations. 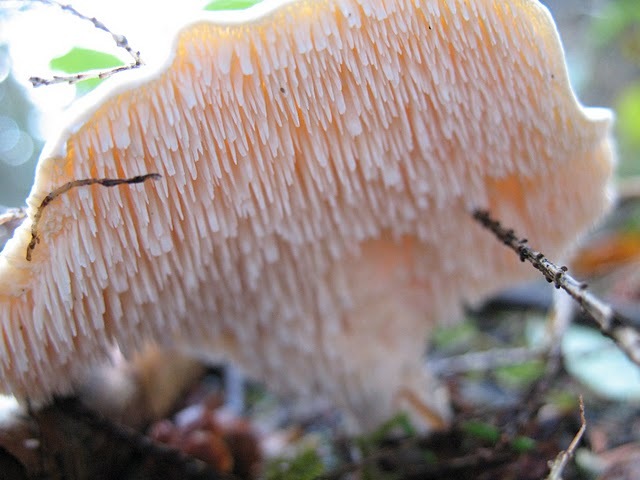 The illustrations are not sufficient to get a positive identification but a book like this is vital to gaining a broader understanding of fungi and identifying less well known, yet often very abundant, species – edible or not. It is not written with the forager in mind but does indicate ediblity. I don’t own this and it is hard to come by but I did have a friend who had one and it is worth its weight in gold. If you see one second-hand, snap it up! 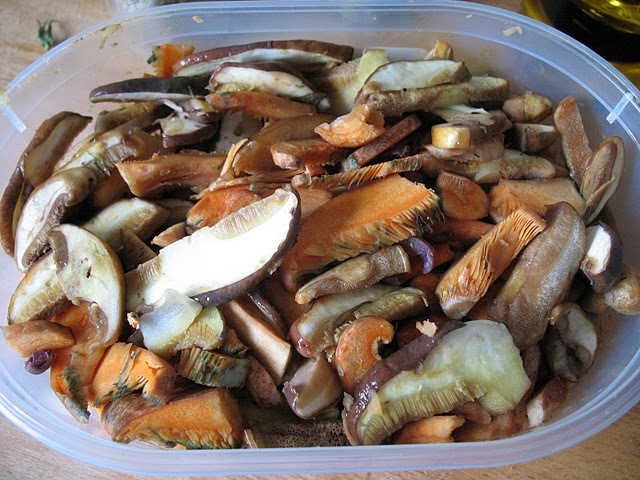 Picking and Identifying Edible Mushrooms – my handy guide for beginners, please check this advice. I have been delighted to find some of these in the field edges and verges this season as I have not seen them for several years. 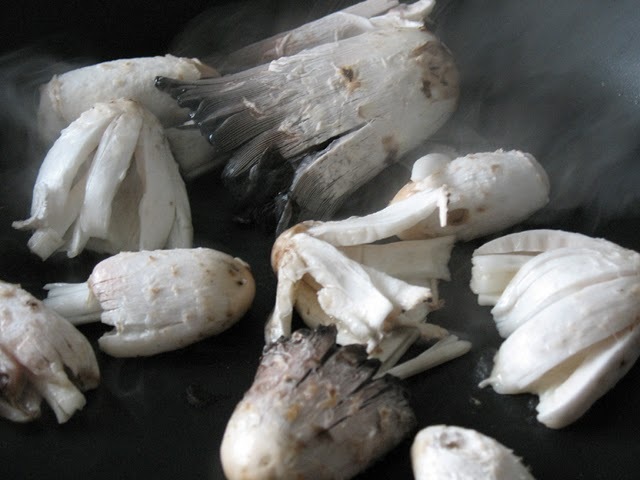 However, a word of caution: these mushrooms must always be cooked, never eaten raw, and some people do have an allergic reaction to it so try a small quantity if it is your first time. 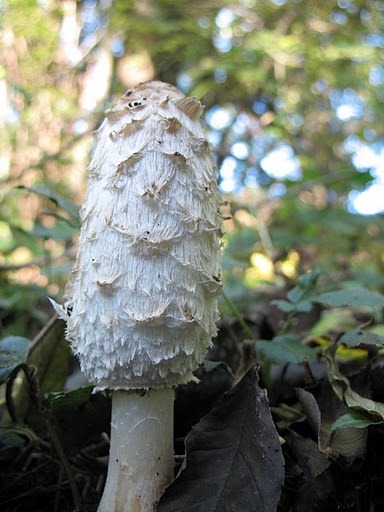 Nevertheless it is a popular mushroom and relatively easy to find and identify. 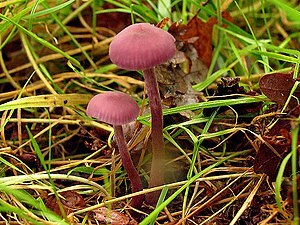 You need to get out early to pick the Blue Leg or Field Blewit (Lepista saeva) because it is equally popular with grubs of various kinds. You are likely to encounter it growing alongside footpaths, on the edge of woodland, fields or roadsides as well as on waste ground – basically anywhere a bit “marginal” and a bit grassy. They will tend to appear repeatedly in the same place so you can go back for more if they suit you. 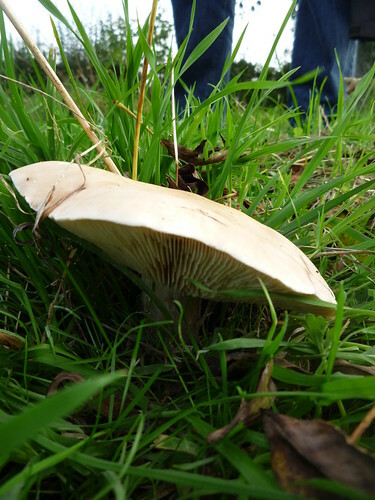 They are distinctive, large mushrooms, with a lilac, streaked tinge to the stem, which itself can be fairly bulbous, and a grey to brown pale cap. The gills are fairly dense and white. I need to stress again that these details alone are not enough to get a positive identification and it is imperative that a good field guide and preferably two guides are consulted if you have not picked these before. 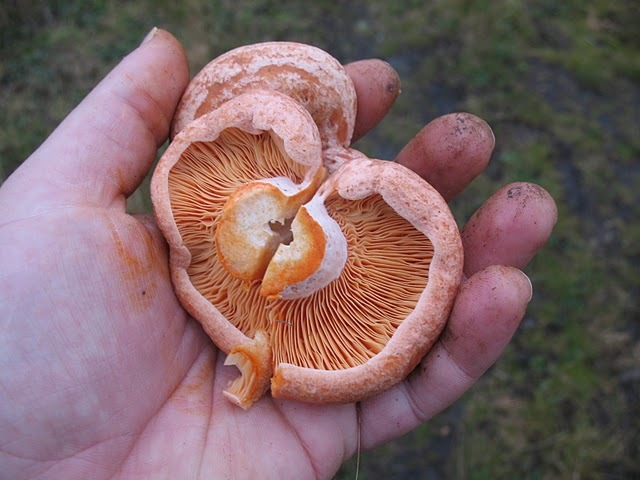 See my article on Picking and Identifying Edible Fungi for some more general guidance of staying safe. Blue Leg can be muddled with the poisonous Livid Agaric (Entoloma sinuatum) which has a much paler cap and a reddish/brown spore print and which will cause sickness. 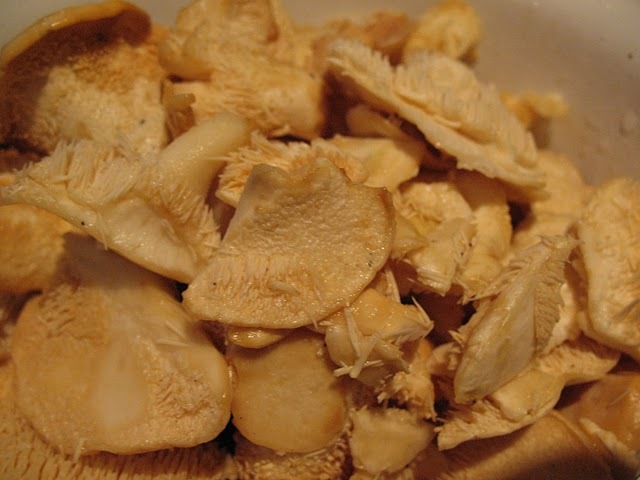 Don’t be put off trying for this mushroom if you are prepared to take the right precautions, though, as the taste is exceptionally good and well loved by foragers. There is a good chance you will be able to find a local person who can show you these as they are so popular. You will notice a slightly perfumed and somewhat un-mushroomy aroma when you cut the fruit bodies and a nice nutty taste when cooked. Cleaning well, chopping and frying in butter with some onions is a good way to bring out the best of the flavour. I’m indebted to Girl Interrupted Eating for the photograph, check out her Girl Interrupted Eating blog for some great Blewit recipes and other fabulous wild food resources. You could also try cooking them The Traditional Nottinghamshire Way.